2004 was a brilliant year for Spider-Man. 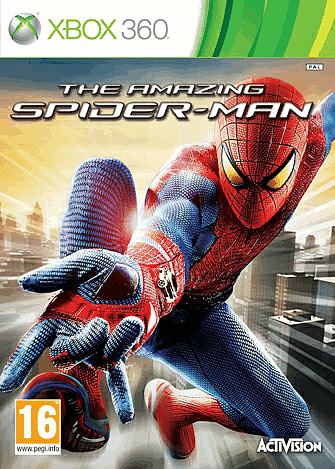 He was top of the movie charts with the summer blockbuster Spider-Man 2, courtesy of Tobey Maguire's web-slinger. And in the gaming world, Activision's spin-off console game had just revolutionised superhero gaming by blending open-world adventuring with awesome web-slinging powers. But those days have long gone. Now it's Batman that has the best games and it's up to old 'web-head' to catch up. The Amazing Spider-Man ties-in with the new film starring Andrew Garfield as the eponymous Spider-Sensed do-gooder, continuing the story where the big-screen version leaves off. Here you're fighting against genetic oddities Rhino, Scorpion and The Lizard, while also protecting New York City from backstreet thugs and bag-snatchers. 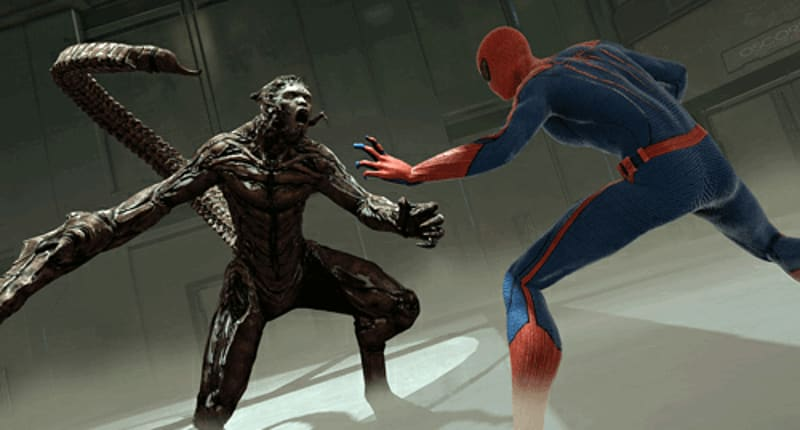 This is the third Spider-Man video game from developer Beenox (after Shattered Dimensions and Edge Of Time), but given the success of the Batman adventures Arkham Asylum and Arkham City, it's not so surprising to see the developer borrow some of the breathtaking gameplay from its DC Comics rival. As a result, The Amazing Spider-Man feels bigger and more ambitious. It also looks more like a film as you flit between one thug punch-up to another. There's a cinematic new third-person camera that gets right up-close-and-personal to our hero, often shaking and blurring whenever something dramatic happens. But more noticeable is the way that the web-slinging ability has been redesigned from scratch. 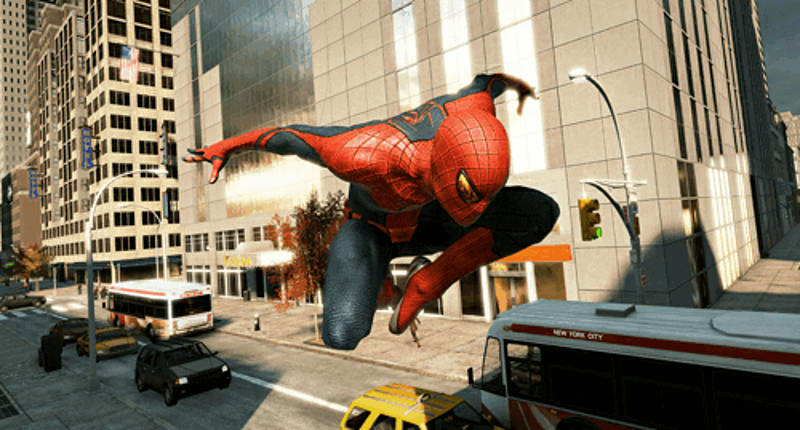 After all, the first thing anyone wants to do as Spider-Man is swing to the top of the tallest skyscraper, admire the beautiful skyline, and then fling yourself through the rest of the city at breakneck speed. So getting across town now involves a rhythmic use of the right-trigger button, with an intelligent physics system accounting for all different heights of skyscraper, speeds and angles. It looks truly amazing as you literally ping between buildings and clouds, but it won't do much to appease vertigo sufferers! To stop the controls from being complicated, though, there's also a new Web Rush technique, which allows you to traverse massive distances in the most spectacular way possible. You freeze time, select a point in the distance, and then sit back and watch as Spidey pirouettes round radio masts, skips over car bonnets and airborne-rolls down long avenues until he reaches his destination. This may seem like cheating in the sense that you're not fully controlling him, but visually it will drop jaws onto floors, while allowing you to still behave like a superhero, even if your own reflexes aren't quite so superhuman. But while great, it's still not quite in the same league as Batman - yet. For a start, while everything looks great in the air, it's less convincing at ground-level. The streets look a tad samey and some of the pedestrians behave in rather comical manner, occasionally screaming in horror, and then returning to normality seconds later. And some of the skirmishes perhaps lack the tension of the martial arts fight-fests that Arkham City has to offer. Not that Spider-Man or Marvel fans will be too bothered, though. This is still an excellent and varied adventure that ranks as the best Spider-Man game for years. The missions are thrilling and the visuals sweet, and it also expands the Marvel universe with cool new enemies and locations. Beenox has done a grand job of bringing the character's bone-bending agility to gaming screens. Just be careful if you play it before seeing the film: the fact that it's plot kicks off at the end of the movie could be something of a spoiler. You have been warned!